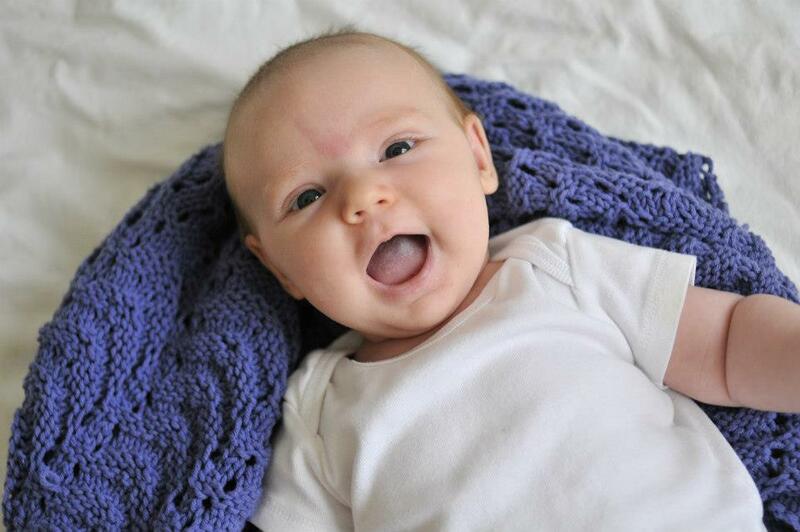 [..] a rapturously breathless cry of children’s voices filled the room. “Two, two!” they shouted. 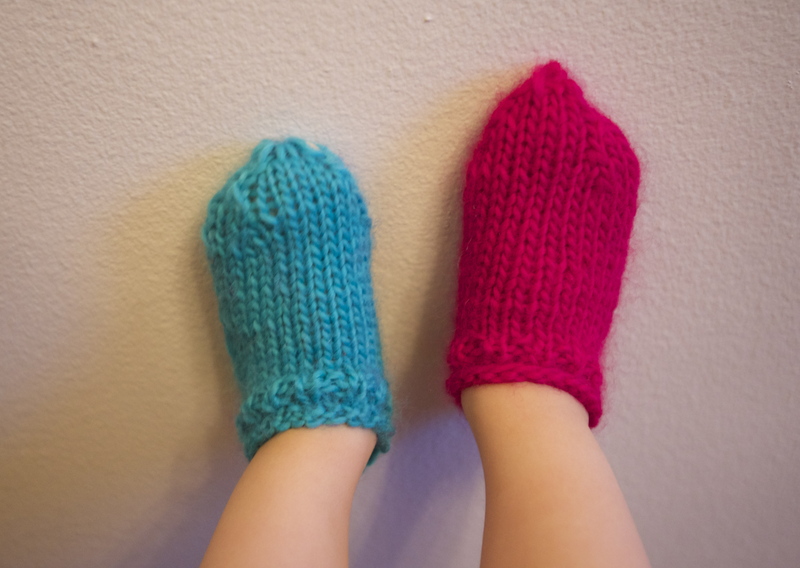 This meant two stockings, which by a secret process known only to herself Anna Makarovna used to knit at the same time on the same needles, and which, when they were ready, she always triumphantly drew, one out of the other, in the children’s presence. 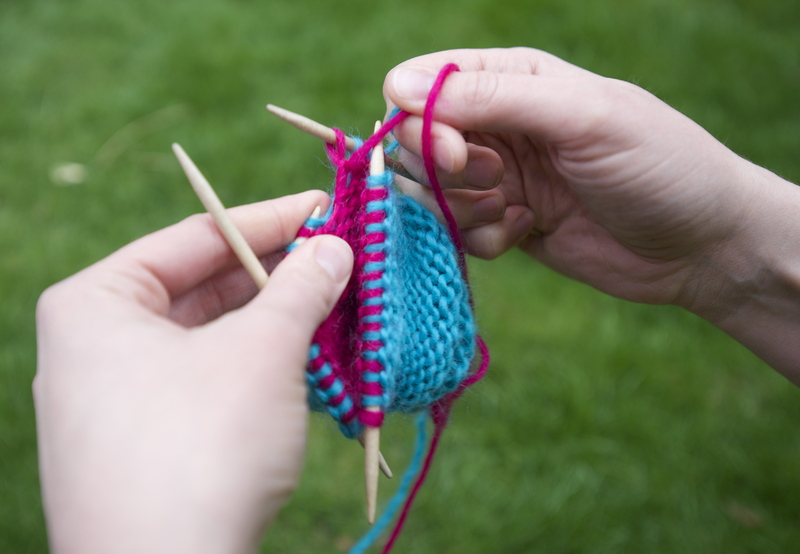 It was only a matter of time before Anna’s secret was out, and now we can all impress small children and curious onlookers with this somewhat astonishing knitting technique. 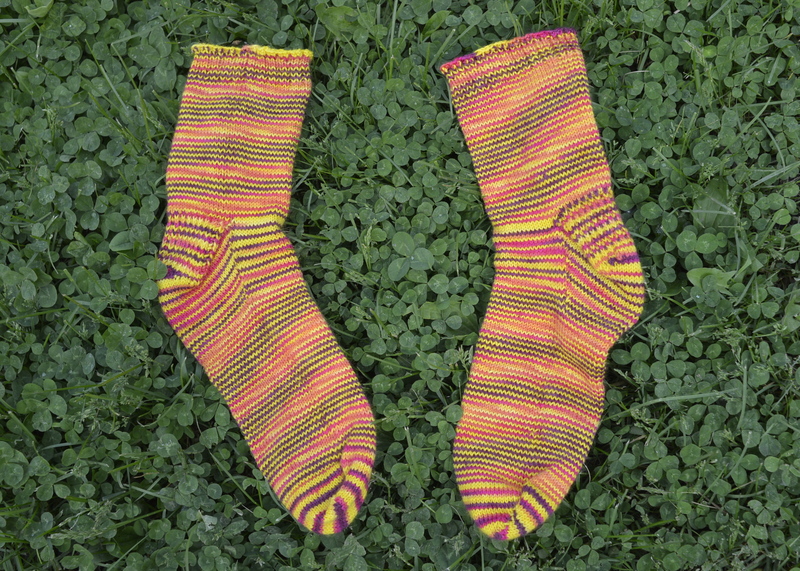 Very closely related to double knitting, this technique allows you to knit two socks simultaneously, inside one another. 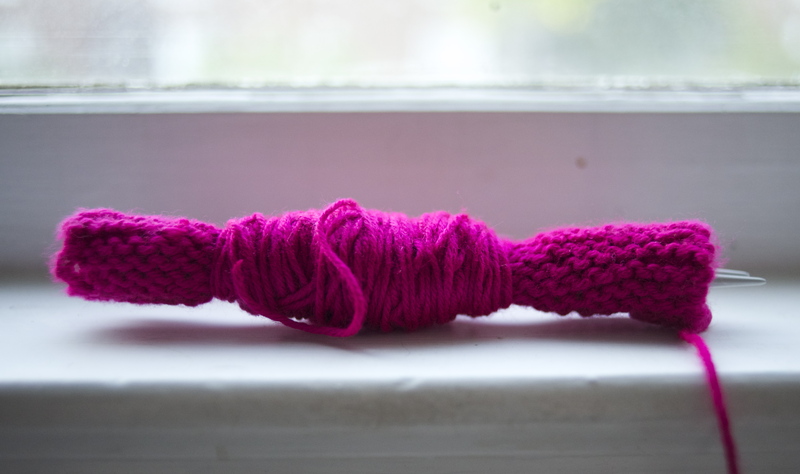 (Alternatively, if you alternate colours, and thereby interweave your yarns, the two fabrics will become interwoven and you can create a fabric that has no wrong side, like this fantastic scarf by Andre Sue). 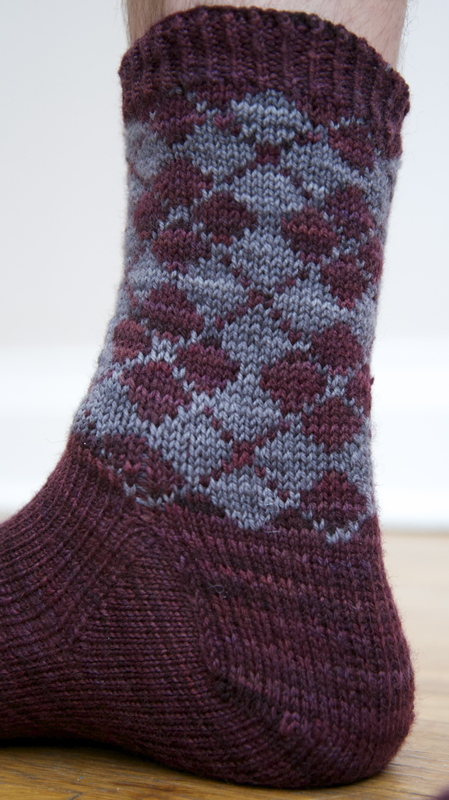 The big reveal: kissing socks! There are long three part youtube tutorials on this method that taxed my attention and ability to follow a video. 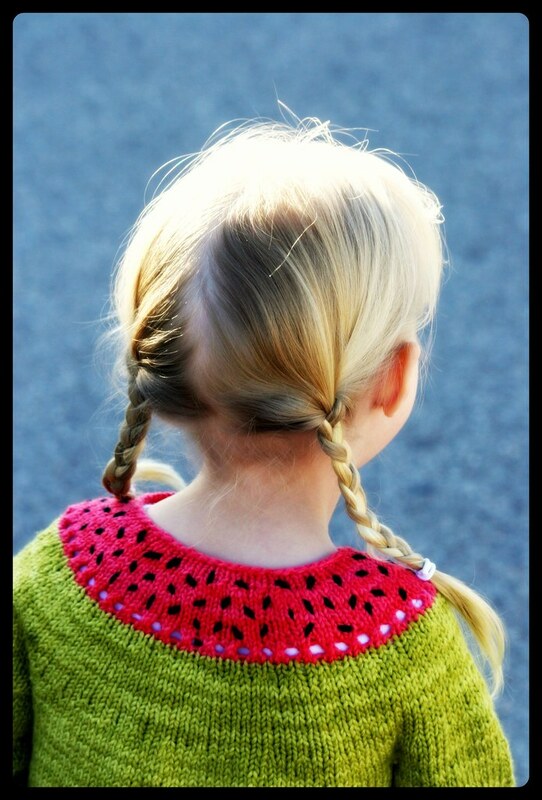 There is also a pretty comprehensive photo tutorial on knitty. 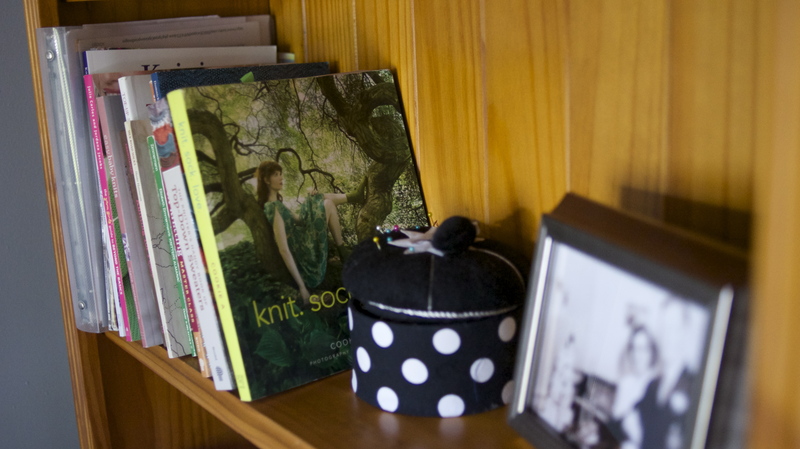 However, I’d strongly recommend taking a class, if there’s one offered in your area. 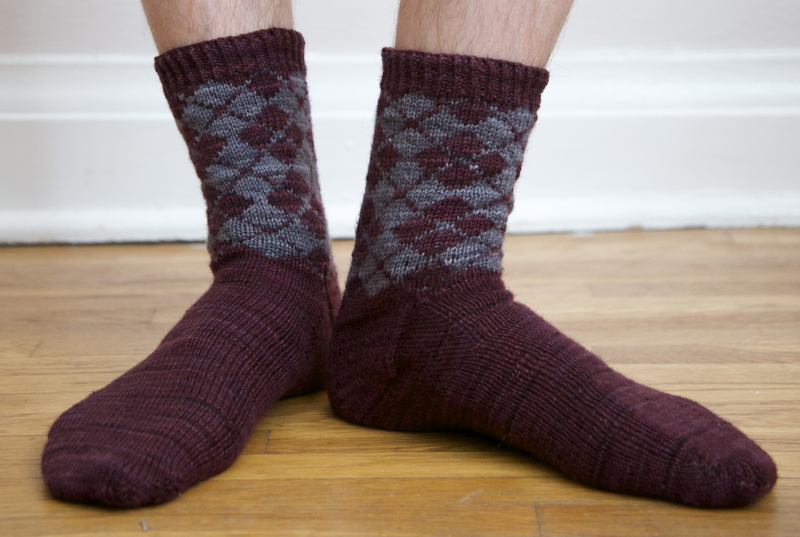 These trainer socks, in worsted weight yarn, were achieved knitting every second stitch from one ball of yarn, and purling every other stitch from the other ball yarn. 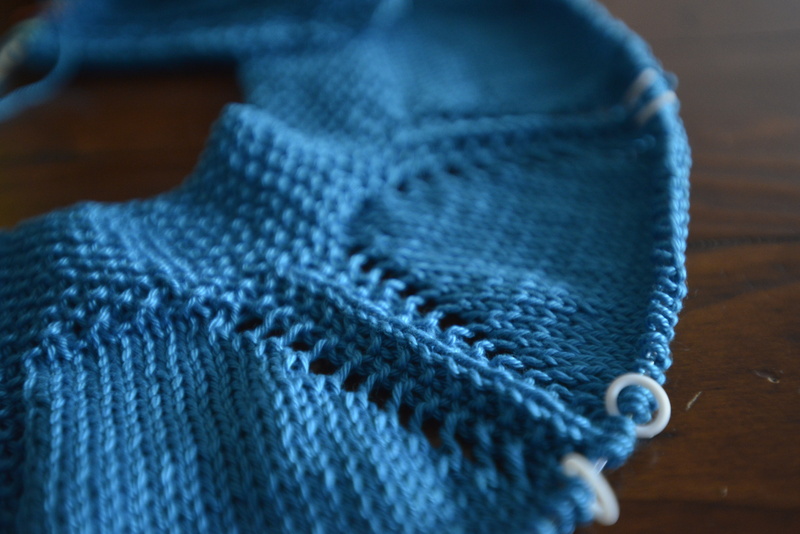 The stockinette sections are relatively straighforward, but the inside out ribbing, titling increases and simultaneous gusset pick-ups are not for the faint of heart. 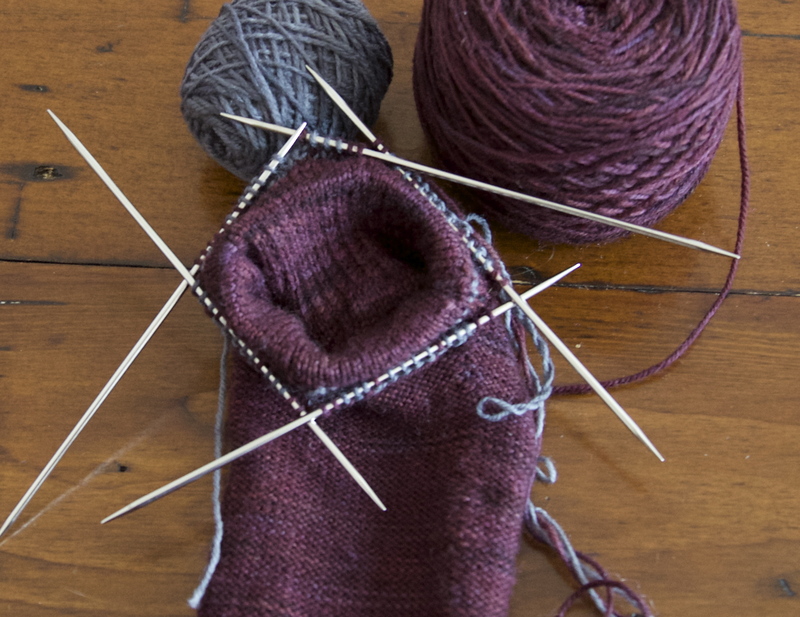 I’m not sure that this technique will save me any time, but it will definitely add a bit of interest to the task of knitting basic stockinette socks, and impress anyone who witnesses the big reveal. 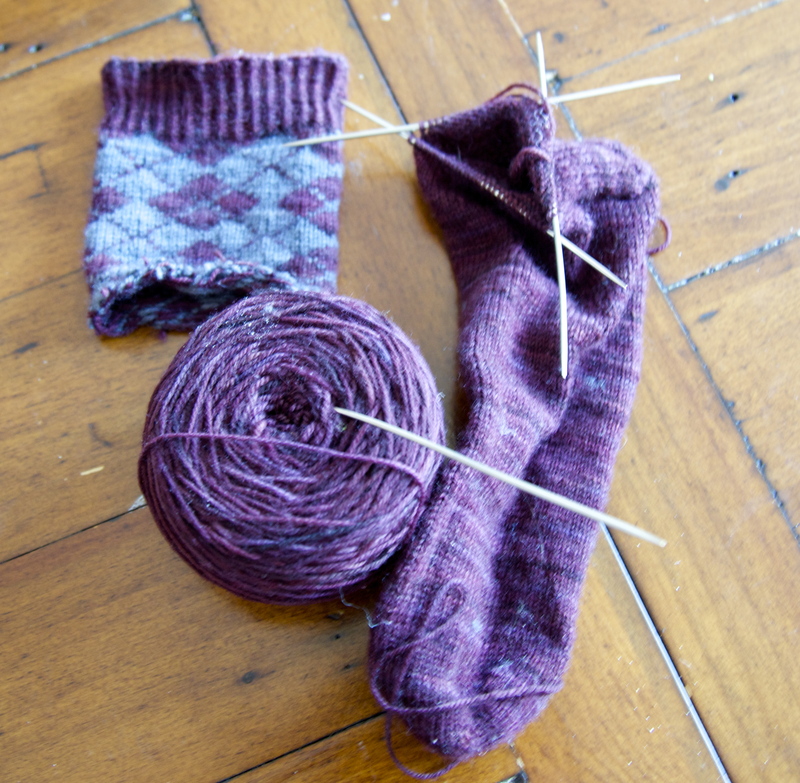 Turns out my sloppy two-in-one worsted socks are perfect slippers for my son! 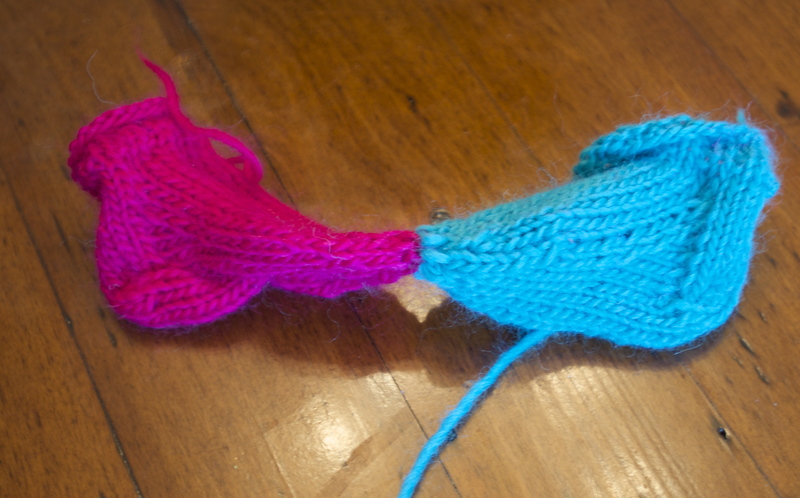 Because I was learning, I knit my trainer socks in two very contrasting colours, and here you can see the pink sock materializing inside the blue one. 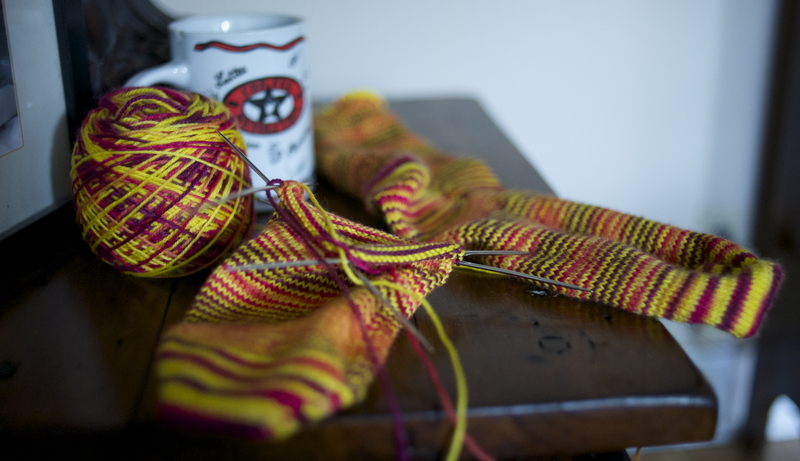 Our instructor recommended knitting real socks this way in self-stripping yarn, but making sure the stripes do not align (that way you can see which sock is which). 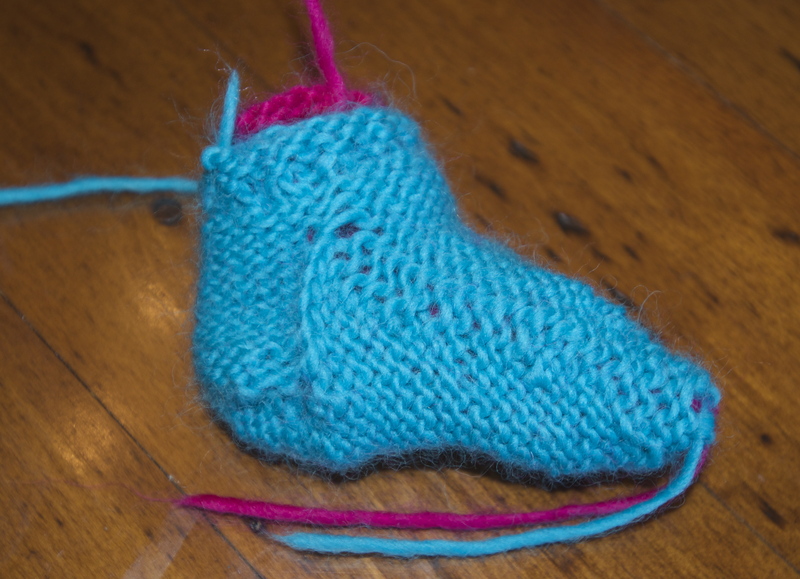 I’m thinking of taking this a step further and knitting two sort of matching socks at once (for example, 1 pink sock with a blue heel and toe and 1 blue sock with a pink heel and toe). 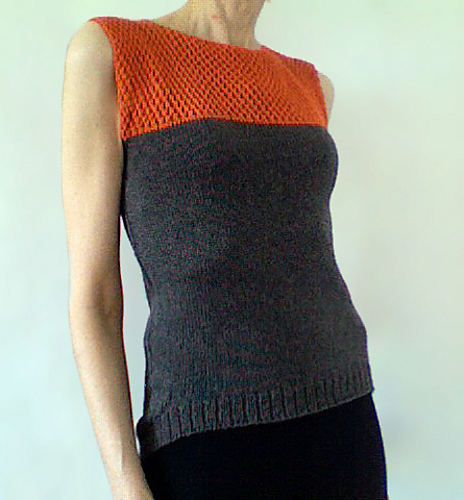 When I do conquer Anna Makarovna’s techinque, it’ll be using Kate Atherly’s pattern. Which all begs the question: Can I sustain it while watching this season of Game of Thrones? 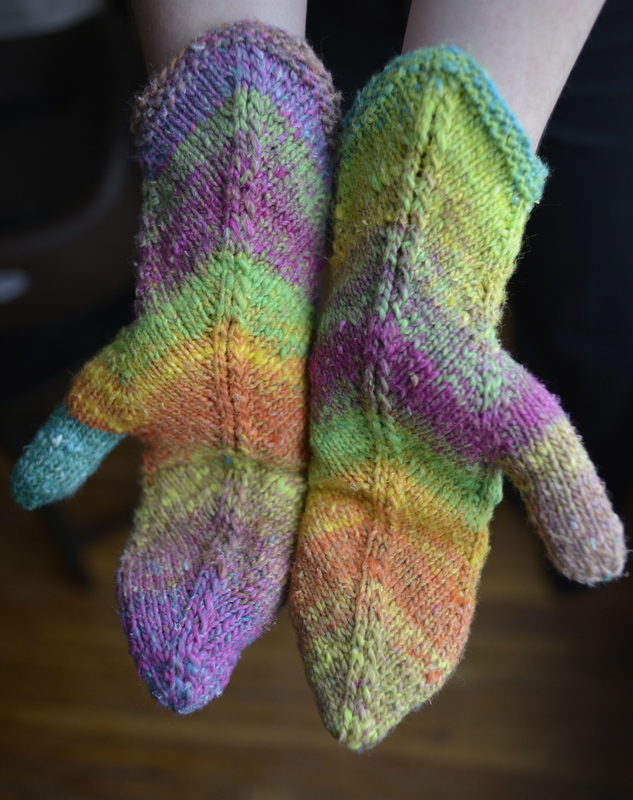 This entry was posted in Knitting, Socks and tagged double knitting, Kate Atherly, knitting, socks, War and Peace on May 9, 2013 by lisagono.